Optional 10 & 15 year warranties. • Wide range of products, accommodating residential, commercial, and large utility scale projects. • Highly detailed and fully integrated monitoring system. Founded in 2005, Solectria Renewables develops and manufacturers quality grid-tied photovoltaic inverters, string combiners, and web based monitoring components for residential, commercial, and utility scale solar projects. Headquartered in Lawrence, Massachusetts, the company has quickly established itself as the leading U.S based PV inverter manufacturer. The same renowned MIT engineers who won the American Tour de Sol national electric car race for eleven consecutive years have been running the company since its inception in 1989. At the heart of Solectria's product line are its highly rugged and efficient core inverters, known for their fully integrated design and high efficiency ratios. Solectria's automated production, and advanced printed circuit board assembly ensure the highest of quality standards. 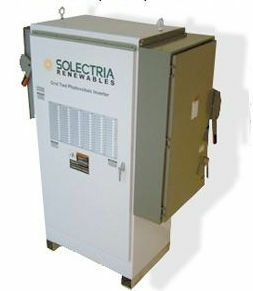 Solectria's product line includes a wide range of residential, commercial, and large-scale utility inverters. The company also offers some of the most advanced monitoring systems on the market. On-board Ethernet and pre-installed wiring for advanced monitoring functions allow for easy installment at revolutionary prices. Solectria's Solren View™ web-based monitoring hardware comes fully integrated with all commercial and Smart Grid inverters. The highly detailed monitoring service is also available for smaller residential applications. All of the company's commercial and utility scale Photovoltaic inverters are made in the U.S.A, allowing compliance with the American Reinvestment and Recovery Act (ARRA), and are listed to UL 1741/IEEE 1547. OR go to our Inverters page.